At the age of 15, Ms Amy Ng dropped out of secondary school because she became pregnant. Now, 21 years later, she has graduated from Republic Polytechnic with a grade point average of 3.75 in her pharmaceutical sciences course. The 36-year-old works as a clinic assistant at Mount Alvernia Hospital and hopes to pursue a part-time psychology degree in the future. It has not been an easy ride. When she was nine, she lost her father to cancer. Then as a teen, she worked as a clinic assistant to lighten the load on her domestic-cleaner mother. The biggest shock was when she became pregnant in Secondary 3. She quit school, gave birth and got married - all in the same year. But the marriage was short-lived and she had to take care of newborn Jody alone. She said: "I do not regret having my son. Although it was tough, it makes me love him more." When she was 19, she took O-level classes but stopped to take care of her son. Ms Ng remarried at 21 and had two daughters, now 14 and seven. At 30, she hit the books again, sat the O levels and qualified for the polytechnic. Juggling her studies, work and family life was "very tiring", said Ms Ng, whose husband is self-employed. She added: "After finishing school, I helped my kids with their homework when I got home. Good things don't come to me often and I learnt to really treasure this rare opportunity to study." 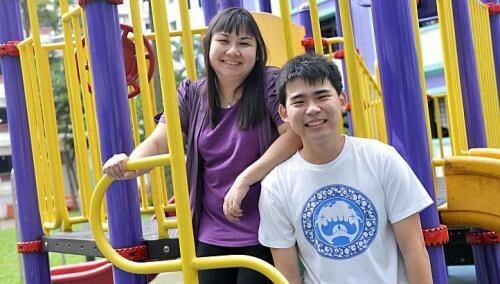 Her son Jody Phang, now 20, is a first-year renewable energy engineering student at Republic Polytechnic. He said: "I'm proud of her. For a mother to go back to studying full time, it's hard."